Christmas is a magical time, but all the extra expenses can really hit hard. Presents, decorations, food, drink, parties... the list goes on. To some, stockings might seem an unnecessary addition. According to Barclaycard and Netmums, it's estimated that the average Christmas stocking costs a huge £71. But can the excited feeling of Santa visiting on Christmas morning really be beaten? Stockings are a festive favourite and shouldn't be a cause for concern this Christmas time. Play your freebie cards right and you'll find yourself filling up your stockings at zero cost. Sign up now for the Magic Freebies Newsletter and Whatsapp Alerts for all our latest freebie finds. Top tip: collect freebies throughout the year and use as fabulous stocking fillers. Bulk out your stockings with freebies! First off, enter now to be in with a shot of winning a Personalised Christmas Stocking and a McDonald's Christmas Jumper. And if you're on O2, you can claim a free Pack of Christmas Cards. Sorted! Get claiming a free £5 kikki.K Voucher just by signing up for their newsletter. This voucher has no minimum spend and so can be used as whole payment, or contributing to something larger. kikki.K stock all sorts of lovely stationery, homeware and gifts perfect for stocking fillers. Play Molton Brown's fun festive game 'Merry Muddlement' to win a Molton Brown Christmas Bath Bundle. There are 200 prizes up for grabs every day and 1,000s in total. Take the Nikwax web-quiz and get a free sample of Polar Proof Fleece Protector - perfect for protecting fleece clothes in wet, wintery weather. Pick up a promo pack of Coco Pops, Rice Krispies or Cornflakes (or use our promo code) to enter to win an Elf on the Shelf Kit. This would make a fun festive decoration for the little (and big!) ones. Grab a free Filippo Berio Recipe Book, filled with all sorts of great recipes perfect for a budding chef. Decorate your walls with a free Classic Car Poster. Get playing the fun online ferry game 'Capital Conga' to win a free Ferry Keyring. Give the gift of kindness this Christmas with a free Pack of Promise Cards. Each pack contains 10 cards and can be used to offer festive promises or to help stick to New Years Resolutions. Food freebies make perfect stocking fillers - keep an eye on the Free Food & Drink page for all the latest and greatest. The hardest part? Holding off eating them until Christmas. The perfect stocking fillers for any foodie! Shopmium and CheckoutSmart are really useful apps to keep an eye on as Christmas approaches. They're both regularly updated with new freebies and offers, which can be saved and kept for stocking fillers. If you're new to Shopmium, sign up now using our promotional link to get a free Jar of Nutella. As well as lots of other great offers and discounts. Are you more of an online shopper than a supermarket sweeper? You're in luck when it comes to food freebies. Sainsbury's and Tesco often have freebies available, just add to your basket, enter the coupon code and the cost will be deducted from your basket. Does anything beat a good cup of tea? We don't think so. Fill your boots (and mugs) with free tea samples, that double as great stocking fillers. Free Peach & Rhubarb Herbal Tea from The London Tea Company. Free Pack of Herbal Tea from Tea-Shirt (99p for P&P). Makeup and beauty products make fabulous stocking fillers, as well as being great ways to try out new products. 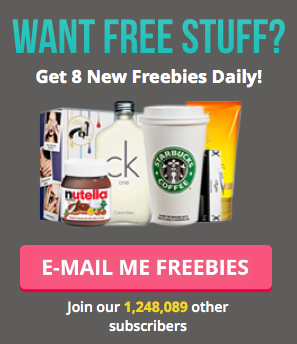 Check out the Free Health & Beauty Section for the most up to date beauty freebies. Top tip: beauty freebies tend to be extremely popular and therefore expire quickly. Sign up for Magic Freebies WhatsApp Alerts for all the best short-term freebies. Free Versace Dylan Blue Perfume - remove ad-block and scroll down the page. These are just some of the beauty freebies we've received from the Debenhams Beauty Club over the past year. Join now, save yours up and you'll have yourself some fab stocking fillers. November's beauty freebie is a sample bottle of Filorga Time-Filler Face Cream and a free sample of JOY by Dior Perfume. Get yours now before they run out! Plus, for an extra special festive surprise, treat your little one to a Free Letter from Santa. A letter from the big guy himself will be something they'll treasure for years to come. Top tip: the last posting date for these are normally early December (to ensure the elves get Santa's letter out in time! ), so make sure you apply for yours ASAP. Free Bag of Perfect Fit Pet Food - full-sized! Are you (un)lucky enough to have a birthday in November/December? ...not by regifting! But by making use of your birthday freebies and popping them in stockings. Get claiming a Free Birthday Candle from Hobbs, which will make a lovely stocking addition, as well as a Free Box of Chocolates from Hotel Chocolat. All with no minimum spend. With £5 being the perfect stocking filler amount, these reward programmes are well worth signing up for. Want even more? Check out our ultimate guide to birthday freebies for the lot. We'll keep updating this blog post in the run-up to Christmas, so keep an eye on here for all the latest free stocking fillers.